Overall remarks about the college are good Of course. The most memorable time and essential time of our life is being spent here in the campus which will be missed a lot. 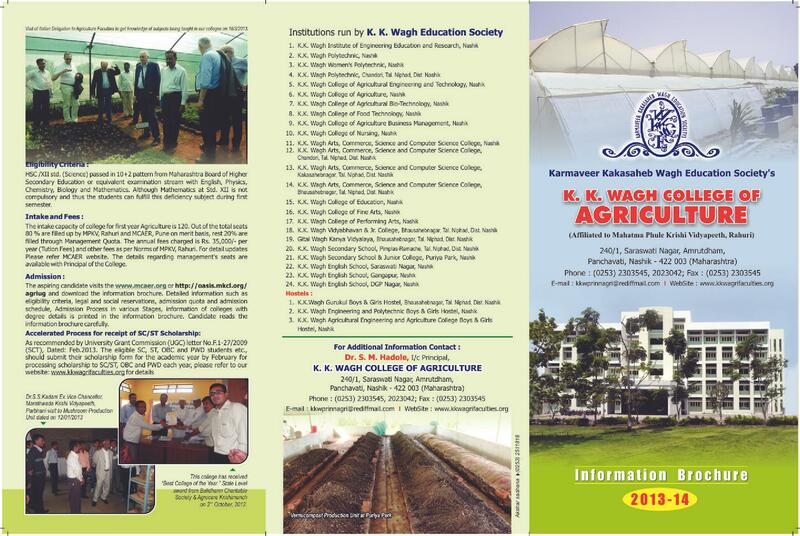 KK Wagh College of Agriculture is a private agriculture college in Nashik, Maharashtra. The college has got numerous farms governed by the authority of K.K. Wagh College of Agricultural Engineering & Technology, K.K. Wagh College of Agriculture & K.K. Wagh College of Horticulture. The backbone of the college has come into existence from the Karmaveer Kakasaheb Wagh Education Society founded in the year 1970. Late Shri. Devram Sayaji, eminent social worker and founder of the organization had ideology of providing education to the rural mass and he supported the same through his pioneering steps. 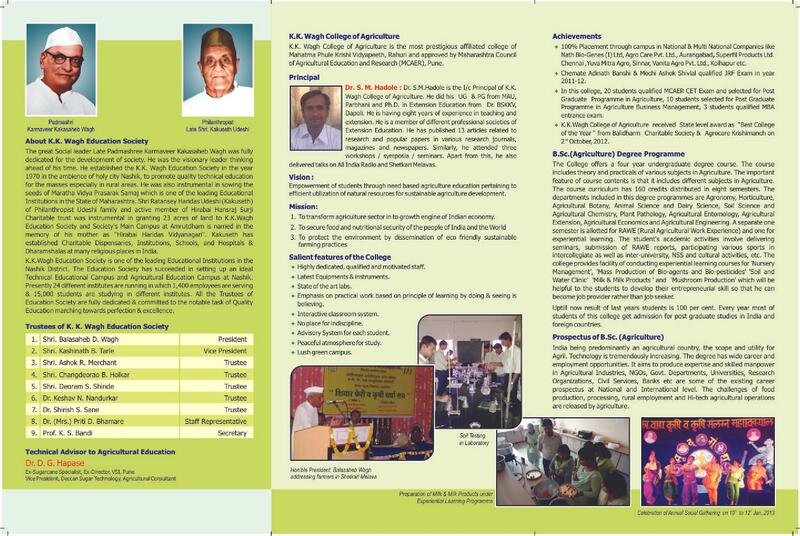 Why join KK Wagh College of Agriculture? The farms (Makhmalabad Farm) covered under the college are maintained with basic amenities like- Rain Water Conservation System. The Kasabe-Sukene Farm under the college has set up for farmer’s training. Medicinal plants and fruits crops are largely grown under various farms that keep options open for new and different methods of cultivation. The centre Kasabe-Sukene Farm is specialized in providing education to farmers on the new technology and process of cultivation. This club tries to imbibe the spirit of research and new technology for farming scope. New methods of experimentation and design are carried under the farm of Babhleshwar Farm administered by the college. The college has Puria Park Farm has aims at delivering new resolutions and parameters of wok and tries to retain the research process by implementing new methods of learning units. Hi Bhushan, the eligibility is XII Std. (Science) passed in 10+2 Secondary Education or an equivalent Examination, with PCB or PCMB or PCM or Inter Agriculture (with Physics, Chemistry) and English, and Obtained score in Common Entrance Test (CET) of the respective year conducted by the competent authority. The candidate who have passed qualifying examination without Biology / Mathematics shall have to complete deficiency courses as prescribed by respective university. hello, i have just pass out 12 .. i got 62 % in board..And 85 in cet PCB group .. can I get admission..
HELLO,i am frm pune........I am jst Completing my 12th with crop science....I want to join your college after 12th.......Can i Get Addmission??? ?